House Speaker Paul Ryan administers the House oath of office to Rep. Brian Fitzpatrick, R-Pa., during a mock swearing in ceremony in Washington. Fitzpatrick is among his party's most strident critics of Trump's stance to Putin. GOP Rep. Brian Fitzpatrick of Pennsylvania says his former job as an FBI agent gives him the tools to see President Trump was manipulated by Russian President Vladimir Putin. Seen in his official portrait, Fitzpatrick is among his party's harshest critics of Trump's relationship with Putin. A GOP congressman and former FBI agent says he thinks President Trump was manipulated by Russian President Vladimir Putin. 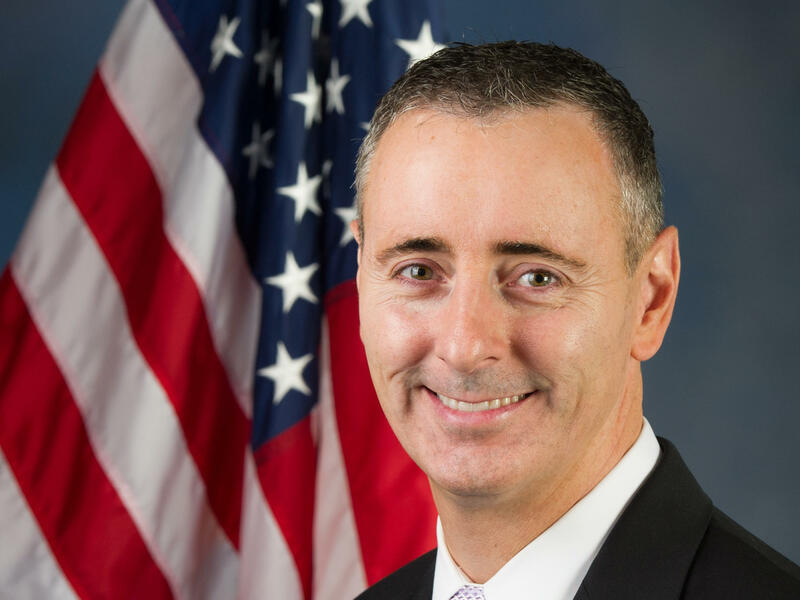 Rep. Brian Fitzpatrick told NPR's Michel Martin on All Things Considered that he drew that conclusion after the two leaders appeared in Helsinki. American intelligence agencies have said they are certain Russia interfered in the 2016 elections. Trump appeared to question that conclusion in Helsinki. He has also called an investigation by Mueller a "witch hunt." Some Republican leaders have fallen in line with the president. Rep. Jim Jordan of Ohio has demanded the Mueller investigation be terminated. The House Intelligence Committee ended its Russia investigation and said it found no evidence of collusion. House Freedom Caucus Chairman Mark Meadows was seen carrying impeachment papers against Deputy Attorney General Rod Rosenstein. Arizona GOP Sen. John McCain said, "No prior president has ever abased himself more abjectly before a tyrant." Fitzpatrick noted to NPR that he has co-sponsored a House bill in support of Mueller's investigation; it was introduced in April but has yet to pass. He noted Sunday that "there's not nearly enough" urgency in the White House regarding Russia's role in the 2016 elections and he decried the "mixed signals" sent on the subject by the administration. If you heard the program yesterday, then you know we spent the hour digging into the fallout from last week's dramatic meeting between President Trump and Vladimir Putin. And one of the issues raised by several commentators was the fact that we've heard more about the meeting from the Russian side than from members of the U.S. government. On Wednesday, Secretary of State Mike Pompeo is set to brief members of the Senate Foreign Relations Committee about the meeting. As you may recall, the meeting came just days after an indictment described how 12 Russian military intelligence agents allegedly hacked Democratic emails in an effort to sow confusion prior to the election. After the meeting, President Trump seemed to side with the Russian denial over the determination of the U.S. intelligence agencies. The president has since said he does believe the agencies. 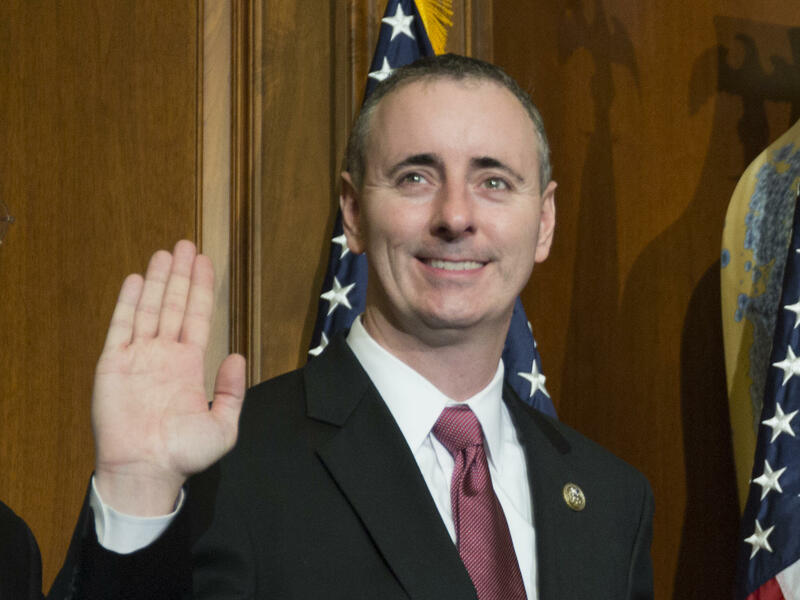 But we wanted a perspective from someone who knows quite a bit about both of these issues, so we called Congressman Brian Fitzpatrick. He is a Republican from Pennsylvania. He sits on the House Committees on Foreign Affairs and Homeland Security, and he's also a former FBI special agent. Congressman, welcome. Thanks so much for talking with us. BRIAN FITZPATRICK: Thanks, Michel. My pleasure. MARTIN: So we mentioned that you have a background in investigations. What was your reaction when you saw the meeting last week and as you saw the events of the week unfold? PATRICK: Yeah. I mean, I was beyond disappointed and, quite frankly, sickened by the exchange. And I talked to Will Hurd a lot, my colleague. You know, I'm the only FBI agent in Congress. Will's the only CIA officer in Congress. And both he and I have had significant experience in the area of intelligence and counterintelligence, specifically dealing with Russian aggression. And he and I both had the same exact reaction. We felt that the president was manipulated by Vladimir Putin. Vladimir Putin is a master manipulator. Will Hurd - and I've seen this up close and personal in the work we've done in our prior careers. In fact, my last overseas assignment for the FBI was in Ukraine. And this is a very dangerous man. He's not someone who can be trusted, and it was very, very disheartening and, quite frankly, troubling to see that exchange. MARTIN: Other colleagues of yours, notably Congressman Adam Schiff this morning - he's a Democrat - said that the president is acting like he's been compromised by Russia, which takes it a step further. Now, I bring this up, you know, carefully because it is a delicate matter. But, as a former special agent, have you allowed yourself to consider that possibility? PATRICK: Well, that's the whole purpose of the Mueller investigation, which is why I was supportive of him being appointed - him specifically. He's my former boss. And it's one of the reasons why I think I was one of only two Republicans to cosponsor legislation to protect the integrity of the independent counsel. I'm a big believer in allowing the law enforcement folks to run their case, to see it through to the end and then to report those findings to Congress. And, at that point, that's when we start making our decisions. MARTIN: So now the secretary of state, Mike Pompeo, is set to brief your counterparts on the Senate Foreign Relations Committee this week. So what are you hoping that he will discuss with your colleagues on the Senate side? And I'm also wondering if you're hoping that he will also come to the House side and similarly brief you. PATRICK: No. I think he needs to brief both the Senate Foreign Relations Committee and the House Committee on Foreign Affairs, which, as you're aware, I sit. And I think he also ought to brief the Intelligence Committee where Will Hurd sits. We have significant concerns, Michel. We cannot be sending any ambiguous messages on behalf of any branch of the United States government to the world about how we view Vladimir Putin. He is a KGB thug. Let's make no mistake about it. He can't be trusted. He's a master manipulator. And what this man has done and his regime has sowed seeds of discord throughout the world in order to create chaos and fill vacuums thereafter. And it's a very serious threat. We cannot be harsh enough with our sanctions. I will support virtually any bill that comes before the House that, A, protects our electoral system from future hacks and attempted hacks and also that sanctions the Russian oligarchs and the Russian regime to the greatest extent. MARTIN: Do you have any understanding or have you gotten any information from any source in the administration about what happened in that meeting? PATRICK: We don't, which is a problem. We need to be given information as to what transpired, what was said, what wasn't said and what the takeaways were because, you know, we have a responsibility to our constituents. The issue of Russian aggression and Russian interference with our election is an area of significant concern to my constituents, and I'm sure everybody's across the country. And we need to be able to answer to them, and we can only answer to them if we know and get briefed on what the contents of that meeting were. MARTIN: And, going back to the issue of sanctions, which you also raised, that you have consistently pushed for more sanctions on Russia. And there has been some action on this. But, overall, do you think that there's a sense of urgency about that in the administration? PATRICK: There's not nearly enough. I can tell you that. You know, I have complete confidence in our intelligence community. I used to be part of that intelligence community. Their assessment of what happened in the 2016 election has not changed, and my confidence in their assessment has not changed. I think we need to be far more aggressive. And the concern, Michel, is that anytime any member of the United States government, particularly someone in the administration, particularly the president, sends mixed signals to the world about the significance of the threat that Russia poses and the reality of what every single person in the intelligence community - these are unanimous conclusions, by the way - that there was, at a bare minimum, an attempt to interfere with our election. And they do that not just here in the United States - they do it around the world. That needs to be a stated fact. It needs to be just accepted as fact by everybody in our government because we need to respond to that reality, and it's a significant threat. We cannot let that happen again. MARTIN: That's Congressman Brian Fitzpatrick. He is a Republican from Pennsylvania. Congressman, thanks so much for talking with us. PATRICK: Thanks so much, Michel. Transcript provided by NPR, Copyright NPR.